We are starting the week off with a little something special for you darlings! 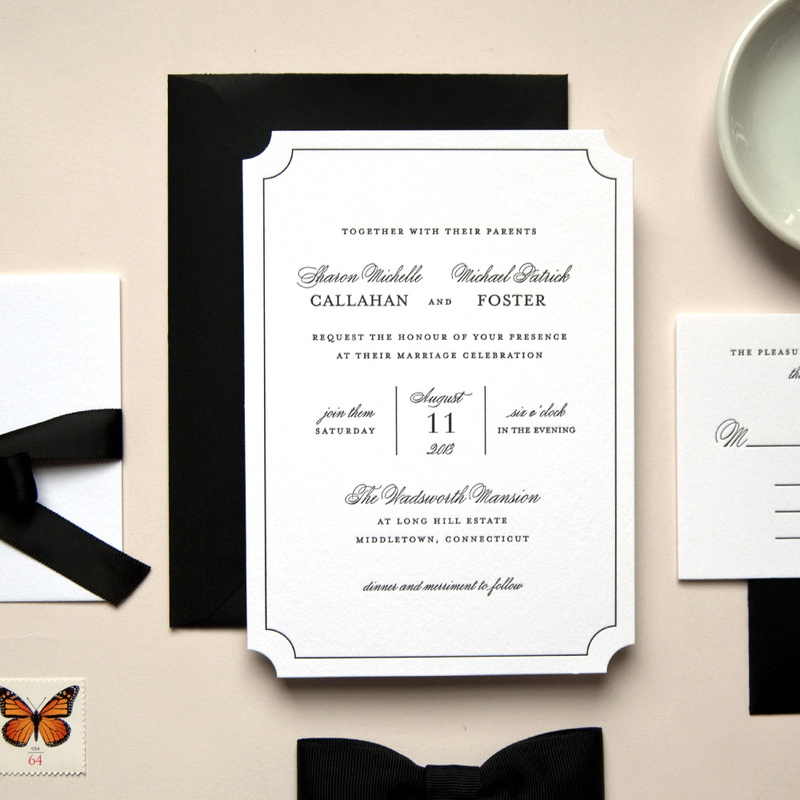 A GORGEOUS stationery giveaway from our sponsor, Kimberly FizSimons. 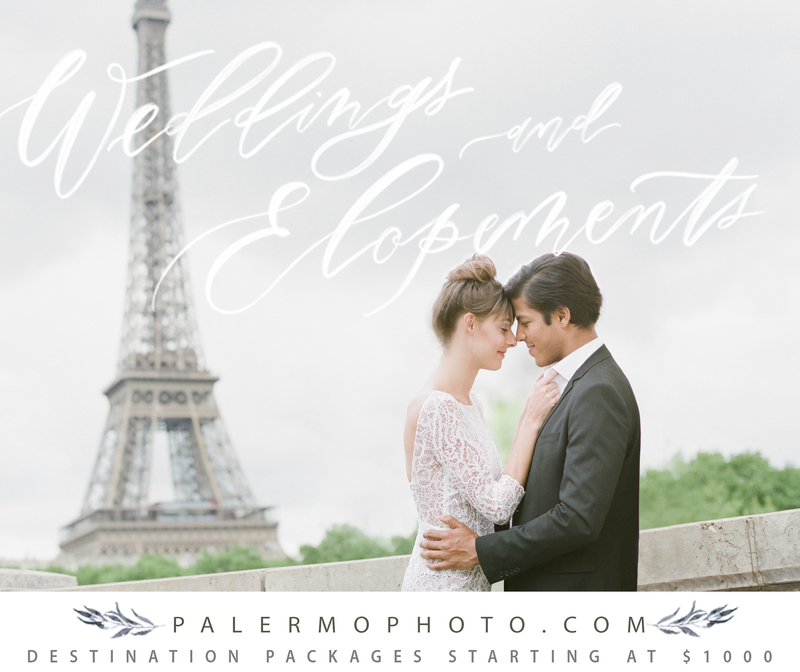 Normal pricing starts at: 50 letterpress wedding invitations + blank envelopes start at $400 // 100 letterpress invitations + reply cards with two sets of blank envelopes start at $860 // 50 personalized note cards + blank envelopes start at $260. So this is a fabulous deal! To enter to win, visit Kimberly FitzSimons, choose your favorite suite, and leave us a comment and let us know which you’d like to win! Winners must have a U.S. address. 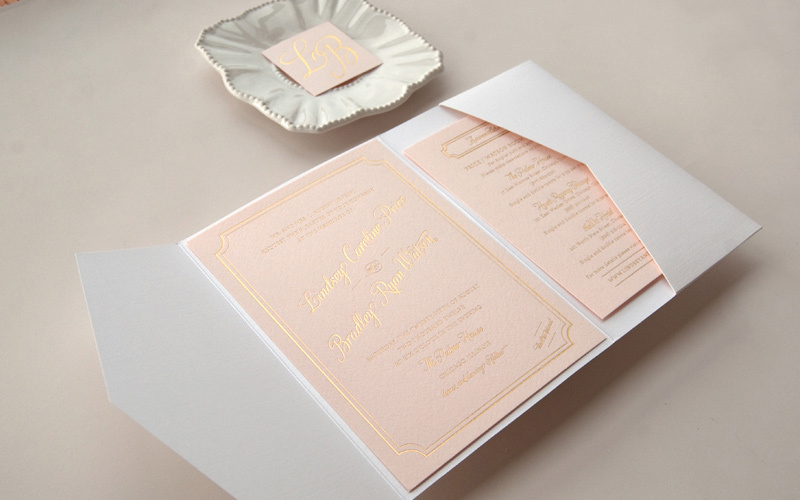 Kimberly FitzSimons is a boutique stationery company that specializes in the design of high quality letterpress wedding invitations and correspondence stationery. 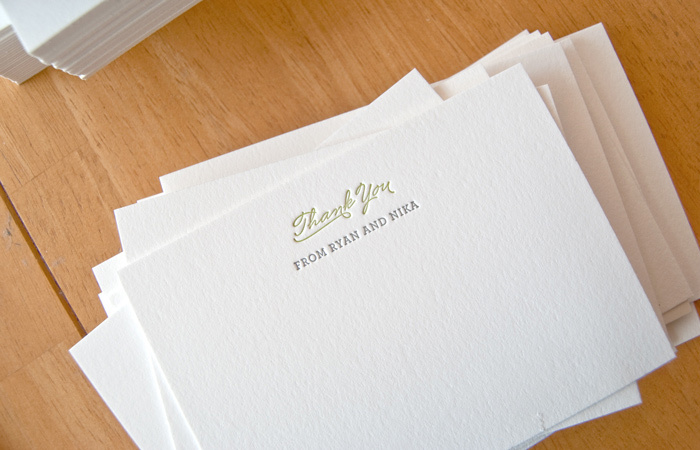 With a penchant for clean and classic elements, their stationery is known for its timeless appeal and simple elegance. They believe in designing with tradition in mind and adding modern touches along the way. Kimberly works one-on-one with her clients to review and select unique customization options that best represent their personalities and events. 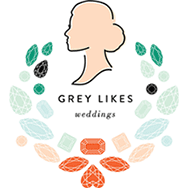 In addition to the expertly hand printed letterpress invitations, she offers edge painting, custom die-cut shapes, metallic foil, custom letterpress printed invitation backers, pocket fold enclosures and more! 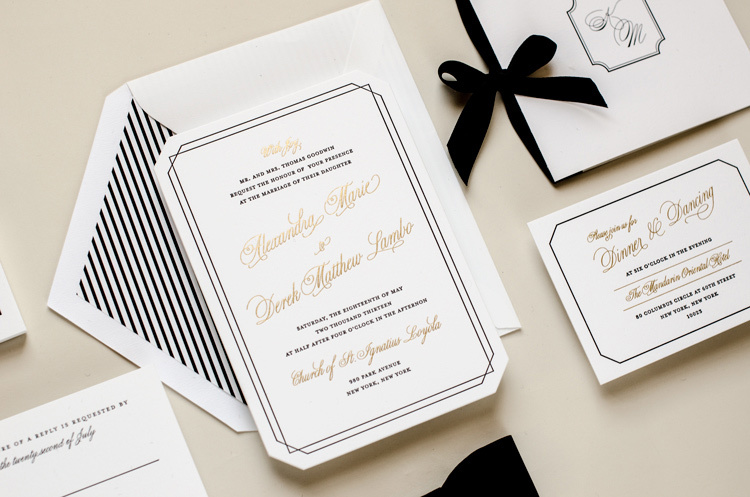 These custom choices allow each invitation suite to be as unique as the bride and groom’s special day. 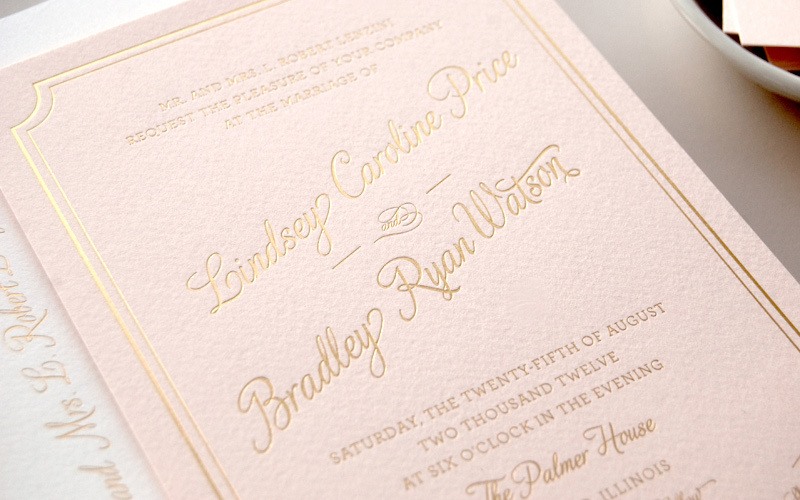 Every single piece of stationery is individually and expertly hand printed on vintage presses in Chicago, Illinois. I would love to win the thank you notes! Everything is beautiful. I would love to win a set of personalized note cards! I have been admiring Kimberly's work from afar for many months, it would be wonderful to win so that I can see it firsthand! Kind of love them all, but 'Merriment' is adorable! Love her stuff! I'm a wedding planner myself and love learning about new stationers! We love the Harmony suite (yes, my fiancé helped me pick it out!) I love the typography and simple, clean style. And those corners! That's the perfect little detail that I was looking for to help the invitations really stand out. Nika and Ryan! And the black and gold suite with striped liners! I would love to win the Lindsey wedding invitations for my wedding next year!! Thanks for sharing! I'd be so happy to win a set of thank you cards! Kimberly's work is beautiful! I would love to win the lovely thank you notes! It would be a blessing to have one less thing to with any while planning our wedding which is overly overwhelming. Ooh my goodness! Would love the pink and gold note cards that matched our invitations!!! I should stop looking at letterpress and get back to honeymooning! Gorgeous invites! My absolute favorite is the Grandeur suite. 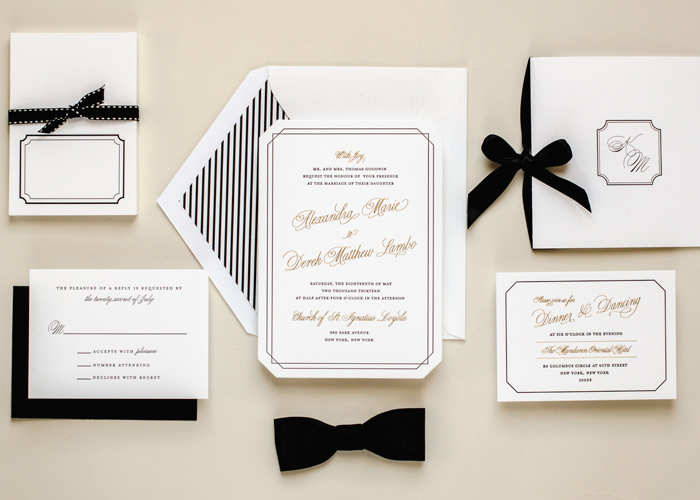 Our wedding is on New Years Eve, and the black, white & gold is the perfect combo for us! I love all of these invitations, but I think my favorite is the soiree suite! So beautiful! LOVE the pink and gold combination!!! Just divine. I'm loving the arrow note set! TFS! I adore the Merriment invites! 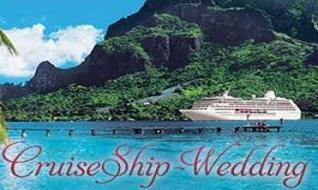 The Harbor invites would be perfect for our Naval Academy wedding. I'd love to win the Lindsey set! All of the invitations are absolutely gorgeous. I would love the Hope Suite because it incorporates lace and traditional calligraphy. 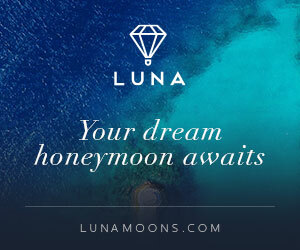 It has everything I am looking for to announce my upcoming wedding! I would choose a set of notecards; I love the script design. 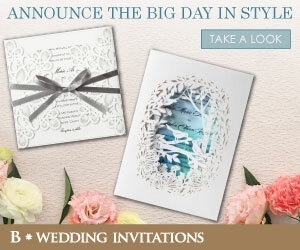 Of the wedding invitations, I love the sweet romantic vibe of the ambrosia design. 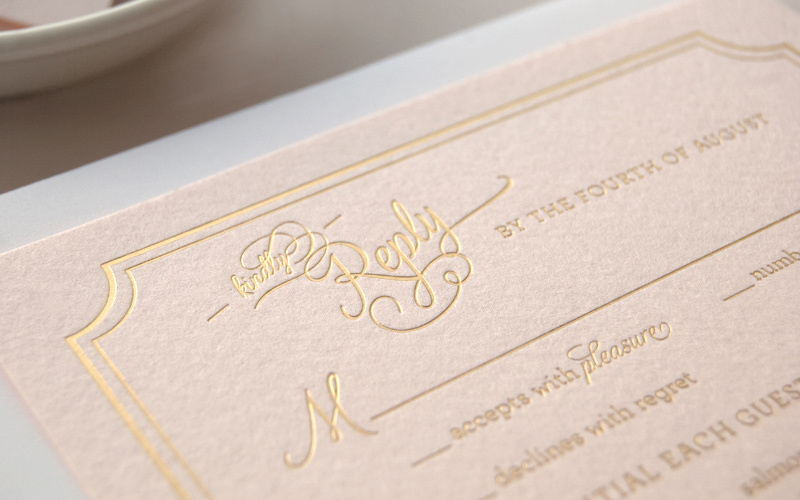 I love the Ringlet and Affair invitations! I love the merriment design, it would be great for my wedding! Love the Ringlet invites! Beautiful! I LOVE GRANDEUR. It would fit my art deco inspired, classic wedding perfectly. Beautiful and elegant. I love the Lindsey! So classy! They are all so lovely, but I can't help but adore 'Affair.' It's absolutely the invitation design/style I envision for my wedding. 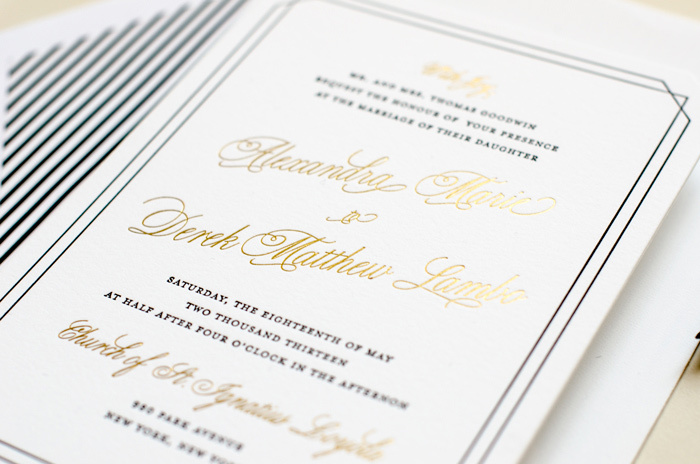 It's truly a classic invitation with a stylish touch! Beautiful work. Love the Lindsey suite! So romantic. I love the Merriment! So great! I've been eyeing the Lindsey suite for my wedding for quite some time. 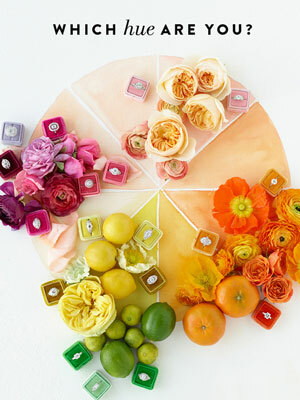 Though I love it as-is I think it would look fantastic customized with our wedding colors! The Lindsey suite leaves me breathless--so gorgeous! and wait...did I see that they could make matching coasters? I would love to win some of those!!! Love the Alyssa and Michael custom invite. So chic. Would work divine with our aesthetic. Lovely options all around! I would love to win the "Hope" suite. Gorgeous! I love Grandeur!!!! Your stuff is so beautiful! 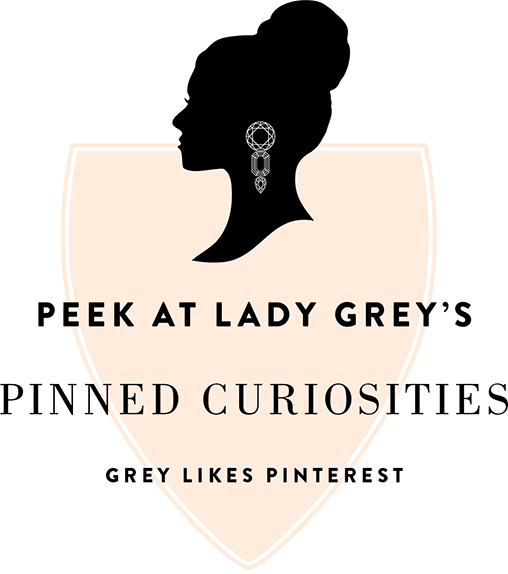 Would love to win Affair, clean and sophisticated with a sense of whimsy! I love the lindsey suite! I love the Merriment suite! So lovely and fresh. Kimberly is amazing! I saw her work on Etsy and have been wanting to use her ever since-- the Affair Suite is my absolute favorite!! Love love love the Harmony suite design. 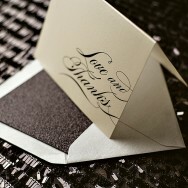 What gorgeous letter press invitations and notes! I love the merriment wedding invitations, although simply having some gorgeous thank you notes would make our day that much more special! I love, love the Grandeur suite! So beautiful! I love Kimberly's work! I saw her invitations when I first got engaged, bought samples but sadly realized they were out of our budget, so I would love to win this contest! My favorite design is the Affair suite, modern yet whimsical. The affair suite is my fave! OOOO I love Grandeur. Perfect for NYE! The "Grandeur" suite is gorgeous, but "Grace" and me are meant to me (and Grace is my grandmother's name)! I love the Affair suite! So chic. Thanks for the chance to win! Writing (what seems like) millions of thank you notes these day! Fun, beautiful stationary would make the task much more enjoyable! I love all your work, Kimberly! I love Kimberly's work! I wish she had been around when I got married. I would love to win the note cards. I love the Affair note cards, very classy! I would love to win this so much. LOVE letterpress. I would love the Lindsey collection! That is just me!!! These are the kinds of invitations I could only dream about. The Posh suite really spoke to me. Definitely fits my theme. I hope I win! I would love to win a personalized set of letterpress cards! Great wrk Kimberly! I'm already a Mrs., but I love the script notecards! (I'm rocking a cushion cut--the option was not listed) I love the Merriment invites! I would love to have the Merriment Suite for my wedding next spring! 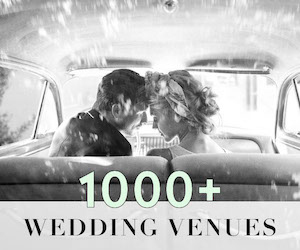 I love love to use the Merriment suite for my wedding next spring! Love the Affair suite- the coloring and white space is beautiful! Love letterpress! My favorite is the Ringlet! It would go great with my rustic-romantic-barn theme. Dearest Grey, I checked out yo' girl Kim, and I must say the Circle suite rocked my damn socks right off my soon to be dancing feet. I hope you pick me, because let's face it -- nothing rules harder than classic typewriter font, and invites such as these would truly compliment my rule-worthy nature. I'd Be An Excellent Pick, C.
The Harmony suite is beautiful! Thank you for this opportunity. All of the stationery is amazing! 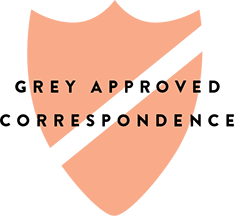 I adore the, Soiree invitations : ) Thank you. I just can't wait to see more pictures of that befauitul wedding, it lokked like a real long unforgettable and fantastic celebration in those few other pictures, I guess you could call it a L.U.A.F kind of wedding.Toodles for now. 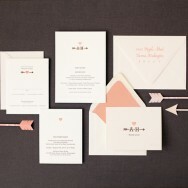 Love the Grandeur wedding stationary! Completely our style and theme! Awesome contest! I love the Grace collection... Simple, clean, and classic. Winning this contest would be amazing for us, as we are paying for the wedding ourselves. I absolutely love the Grandeur Suite and would have died to have it for my own wedding. Gorgeous! I'd really love to win the Merriment suite. Coming from a girl who has been trying to convince her fiance for the last month that we can't just "text" our guests...winning this suite would be much appreciated! I would LOVE, LOVE, LOVE to win the GRANDEUR suite! It would be perfect for my wedding!!! !